One of the largest obtainable maps of the former Confederacy published shortly after the American Civil War. Map of the Seat of War to Accompany the American Conflict. 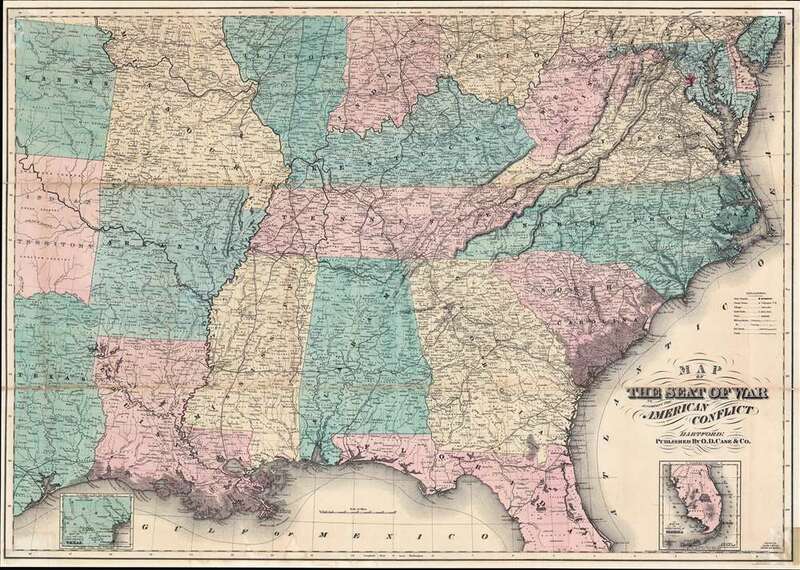 This is an 1866 O. D. Case and Company map of the southern United States. The map depicts the southern United States from the Mason-Dixon Line south to the Gulf of Mexico and from Kansas, Oklahoma (Indian Territory), and Texas to the Atlantic Ocean. This important map was published one year after the end of the Civil War in Horace Greeley's book The American Conflict. An important work about the war from the Unionist perspective, this map visualizes the information it provides. Highly detailed, state capitals, large cities, and towns are labeled throughout, from Ohio to Florida, with Washington, D.C. shaded in red, which allows it to stand out from the States. Civil War battle sites are labeled, along with railroads and rivers, key components to the war for both the Union and the Confederacy. The topography along the coast from South Carolina to Virginia is illustrated. Two inset maps are present: one, in the lower right corner, illustrates the lower portion of Florida, the other, in the lower left corner, depicts the lower portion of Texas. This map was engraved by Oliver J. Stuart and published by O. D. Case and Company. Very good. Backed on archival tissue for stability. Tape residue on the lower right corner. Blank on verso.